Branchial cleft cyst is a rare birth defect which chiefly affects the neck. Though the defect is present at birth, it generally becomes evident in childhood or adolescence in most cases. An initial clinical presentation of the defect in adulthood is very rarely encountered. Branchial cleft cyst (also called Branchial cleft remnant) is characterized by the appearance of a lump, which develops one or both sides of the affected child’s neck or underneath the collarbone. The occurrence of this congenital birth defect is linked to the ‘early embryonic development’ stage -- specifically the fifth week of fetal development -- during which the major neck structures are formed. Due to this defect, the normal development of the tissues in the neck and collarbone, or branchial cleft, is hampered. The tissues comprising the neck structures formed during the ‘early embryonic development’ stage later become the cartilage, blood vessels, muscles and bone. The appearance of Branchial cleft cyst is typically in the form of an opening, or cleft sinuses, on one or both sides of the child’s neck. 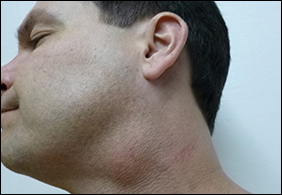 Due to this abnormality, there is an atypical form of tissues within the neck. These tissues may lead to the formation of pockets called ‘cysts’ that contain fluid, and may form passages which drain to an opening in the skin surface called fistulas. The cysts, lined with skin and lymph cells, may become infected or cause skin irritation, and result in difficulties with breathing or swallowing. In some rare cases, cancerous tumors may develop at the site of a branchial cleft in adults. There are four main types of Branchial cleft abnormalities --- (i) First branchial cleft anomalies, in which cysts develop around the earlobe or under the jaw (ii) Second branchial cleft sinuses, which open on the lower part of the neck (iii) Third branchial cleft sinuses, which develop close to the thyroid gland in the front part of the muscle which attaches to the collarbone (iv) Fourth branchial cleft sinuses, which affect the area below the neck. The most common type of Branchial cleft abnormality is ‘Second branchial cleft sinuses,’ or the failure of fusion of the second and third branchial arches. Branchial cleft cysts account for nearly 20% of neck masses in children. While the cyst may generally not be dangerous, it is important to take the affected child to the doctor without any delays, for an official diagnosis of the problem. Feeling of pressure in the affected area. Draining of fluid from the neck of the child. Formation of a small lump or mass on the side of the neck close to the front edge of the sternocleidomastoid muscle. Formation of a lump, dimple or skin tag on the child’s upper shoulder, or slightly underneath their collar bone. Swelling or tenderness in the child’s neck, generally occurring with an upper respiratory infection. Branchial cleft cysts generally develop in late childhood or early adulthood as a solitary, painless mass which becomes infected, though it is not noticed earlier. According to Ayurveda, the formation of cysts is an indication of an aggravated ‘Kapha’ dosha. The imbalance of the Kapha dosha makes it difficult for the body to detoxify irritants. Hence, in place of detoxifying irritants, aggravated Kapha surrounds the irritant with fluid to neutralize it. The indications of the occurrence of a cyst in the body imply that the imbalances are becoming stronger, and the body’s resistance is being weakened. Hence, the repair of the imbalances is pertinent for preventing/treating diseases, with the treatment of weakened tissues typically undertaken by Ayurveda practitioners with the help of potent herbs as explained in ancient Ayurveda texts. The conservative treatment of Branchial cleft cyst chiefly involves the prescription of antibiotics by a doctor, if the affected child has indications of an infection. The antibiotics are necessary because they can ease the swelling, by draining fluid from the cyst formed in the neck. Besides antibiotics, another treatment for Branchial cleft cyst is the use of painkillers, to reduce pain linked to the disease. However, for preventing future infections, the removal of the cyst may be required, for which the doctors usually recommend a surgical procedure. Planet Ayurveda herbal manufacturing offers some beneficial herbal formulations for the management of Branchial cleft cyst in a safe and natural way. 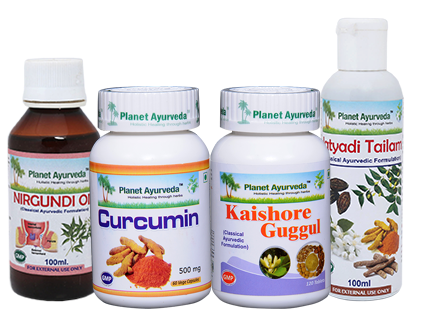 The formulations, prepared under the supervision of renowned Ayurveda experts, are prepared from 100% pure and natural herbs. The herbal products available from Planet Ayurveda are helpful in managing Branchial cleft cyst when it is diagnosed in a child, and also for potentially preventing the occurrence of the defect during the ‘early embryonic development’ stage in pregnant women. The topical application of a mixture of Nirgundi oil and Jatyadhi oil can be beneficial in treating the lump formed in the neck area due to the Branchial cleft cyst congenital defect. Nirgundi oil is prepared from the ‘Nirgundi’ herb (Vitex negundo) and can be used in the form of ointment. The Nirgundi herb is known for its antioxidant, anticonvulsant, and bronchial relaxant properties, along with its ability to manage various skin disorders and relieve inflammation. Jatyadhi oil is also an excellent herbal product for external application in Branchial cleft cyst. The oil is prepared from a combination of some potent herbs including Jati (Myristica fragrans), Neem (Azadirachta indica), Haridra (Curcuma longa), Madhuka (Glycyrrhiza glabra), Daruharidra (Berberis aristata), Manjishta (Rubia cordifolia), Padmaka (Prunus puddum), Lodhra (Symplocos racemosa), Katurohini (Picrorhiza kurroa), Naktamala beeja (Seeds of Pongamia pinnata), Taila (Sesame oil), Sikta (Honey bee wax), and a few other herbal ingredients. Application: For treating Branchial cleft cyst, Nirgundi oil mixed with Jatyadhi oil should be applied externally by patients to the affected areas. The preparation of these capsules involves the use of ‘Curcumin,’ which is one of the main active compounds of the rhizomatous herb of Turmeric (Curcuma Longa). Hence, each of these capsules is packed with the standardized extract of Turmeric, which has amazing medicinal properties, and is widely known for its antioxidant and anti-inflammatory actions. The use of Curcumin capsules can be beneficial for pregnant women for preventing Branchial cleft cyst in the unborn child because the capsules can reduce inflammation, relieve pain, treat cysts and manage swelling. These tablets are prepared from a combination of herbs which can be of immense benefit for expectant woman, in order to prevent Branchial cleft cyst during pregnancy. These herbs include Amalaki (Emblica officinalis), Haritaki (Terminalia chebula), Bibhitaki (Terminalia bellirica), Ginger (Zingiber officinale), Guggulu Resin (Commiphora mukul), Pippali (Piper longum), Black pepper (Piper nigrum), Guduchi (Tinospora cordifolia), Vidanga (Embelia ribes), Red physic nut (Baliospermum montanum), and Indian jaap (Ipomoea turpethum). The use of these tablets can help in treating skin problems, reducing pain and inflammation, treating cysts, and supporting the overall health of all organs of the body. Planet Ayurveda's herbal formulations can be beneficial in treating Branchial cleft cyst in affected children, as well as potentially preventing the occurrence of the defect in an unborn child, during the 'early embryonic development' stage. The formulations are safe to use because they do not contain any chemicals, preservatives, fillers, artificial colours, binders or additives.